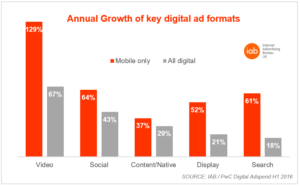 Wednesday (12 October), PwC and IAB UK released the latest digital ad spend study, with the long-awaited news that mobile ad spend (£802m) has taken over desktop spend (£762m) for the first time. In fact, it is mobile that has driven the growth in overall digital ad spend, which has seen a 16.4% rise – the highest first-half growth rate for two years. Mobile itself saw a 56.1% increase in the first half of 2016, meaning £0.36 of every £1 spent on digital advertising is now mobile – just five years’ ago, only £0.04 of every £1 went into mobile advertising. But, it isn’t all about mobile. Video ad spend hit £474m during the same period, representing a 67% growth. The mobile portion of that grew 129%. Video now accounts for 30% of all display advertising, yet 37% of mobile display. Forty-eight percent of display spend now goes into social, with it seeing an increase of 43% to £745m, 80% of which is funnelled into mobile. While there was healthy growth across the board, with all digital ad formats seeing mobile as the key factor in their overall growth, display and search experienced the weakest year-on-year growth, only seeing a 21% and 18% increase in all digital spend, respectively.